Store Legal / International The Legal Framework Applicable to the Single Supervisory Mechanism: Tapestry or Patchwork? 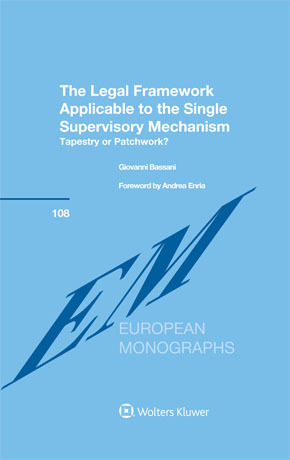 The Legal Framework Applicable to the Single Supervisory Mechanism provides an in-depth analysis of the legal framework applicable to the Single Supervisory Mechanism (SSM) with particular reference to the interaction between European and national law. In this innovative book a leading expert directly involved in the development and implementation of the framework compellingly demonstrates the necessity of removing differences in banking legislation across national borders within the Banking Union. The book analyses all the cases where the European Central Bank (ECB) is required to apply national legislation in accordance with the country of establishment of the credit institutions under its direct supervision within the SSM. Drawing on the case law of the European Court of Justice concerning the transposition of EU Directives the book also develops an analytical methodology to assess the derivation of national legislation from EU law with application to several concrete cases. What are the supervisory tasks and powers of the ECB in the micro and macroprudential spheres? When is the ECB required to apply national legislation? What are the ‘direct’ and the ‘indirect’ supervisory powers of the ECB vis-à-vis significant supervised entities? What are the options and discretions available in EU law? What are the most important prudential options the ECB has exercised for significant supervised entities? What are the main legal obstacles to the establishment of a truly single supervisory jurisdiction within the Euroarea with actual fungibility of capital and liquidity for cross-border banking groups? The focus of the book is on the interaction between European banking legislation and national legislative provisions. The legal analysis in this book supports, with great authority, the demands for a leap forward in the full harmonisation of key prudential requirements within the Banking Union. Legal and banking practitioners, officials in national and European authorities, banking law scholars and policymakers will benefit enormously from the lessons it contains for the way forward of the Banking Union and, more generally, the future of the European Union itself. ‘This is a rich and original book. Against the backdrop of the European integration process – with all its shortcomings and delays – the reader is introduced into the complex legal Framework institutionally centralised within the European Central Bank.